Falling global commodity prices and the normalization of monetary policy in the United States have contributed to widespread currency depreciations in Latin America. In theory, a falling currency is expected to create inflation by driving up the price of imported goods and services—triggering what economists call exchange rate pass-through. Indeed, prices are on the rise in Latin America while they stagnate in the rest of the world. 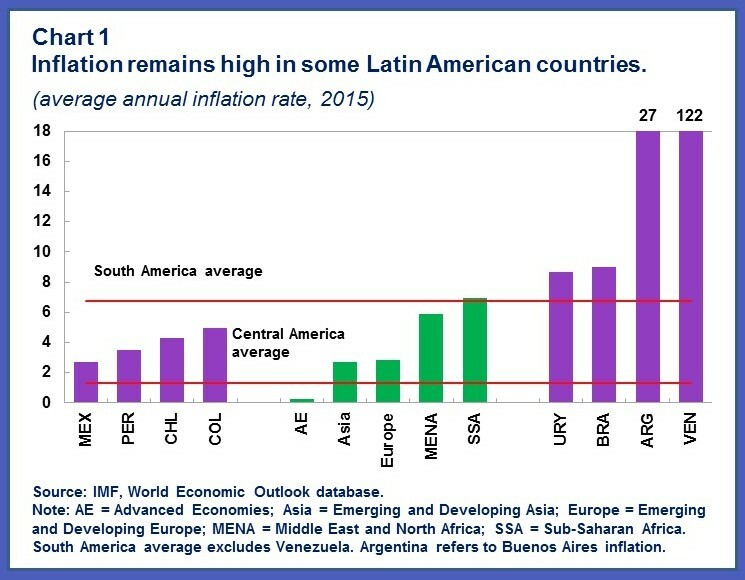 Inflation has remained stubbornly above central bank targets in some Latin American countries and two of the region’s largest economies—Venezuela and Argentina—have the highest inflation rates in the world (Chart 1). Recalling the instability that followed large depreciations in the region during the 1980s and 1990s, should we be worried about the impact of the current depreciations on inflation? Yes and no. Where monetary frameworks have improved substantially over the past two decades, the rate at which currency depreciations are passed through to domestic prices is much lower than in the past. But in other Latin American countries, exchange rate pass-through remains larger than warranted. Our latest Regional Economic Outlook: Western Hemisphere revisits the question of exchange rate pass-through in Latin America. In joint work with Nicolás Magud and Fabián Valencia, we first estimate how consumer prices have been affected by nominal exchange rate depreciations in a large group of countries since the late 1990s. We then compare these pass-through estimates with the import content of domestic consumption, since the price of goods purchased abroad is expected to respond closely to movements in the exchange rate for reasons largely outside the control of the local central bank. This provides us with a benchmark to assess exchange rate pass-through, beyond which we might suspect that second-round factors—such as indexation through wage and pricing contracts, or self-fulfilling price hikes due to expectations—are at work in driving inflation. 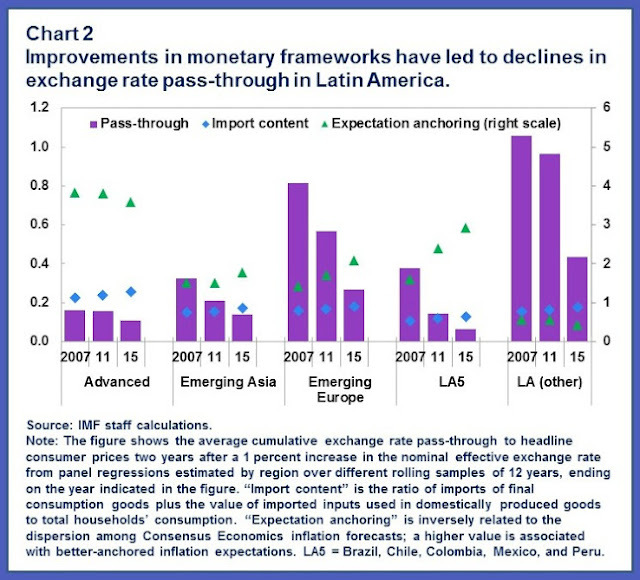 Our findings suggest that pass-through in emerging economies has fallen dramatically over time, including by four-fifths among Latin America’s most established inflation targeters (Chart 2). In these cases, the degree of pass-through has fallen to below 10 percent and is now smaller than the share of imports in the domestic consumption basket—a characteristic that was once limited to advanced economies such as Australia, Canada, and the United Kingdom. This comparison suggests that second-round inflationary effects are no longer playing a major role in these countries. According to our analysis, this strong performance is related to improvements in the credibility of central banks since the late 1990s. Stronger and more independent central banks in the region have been able to better anchor inflation expectations, thus preventing increases in the price of non-tradable goods following depreciations. 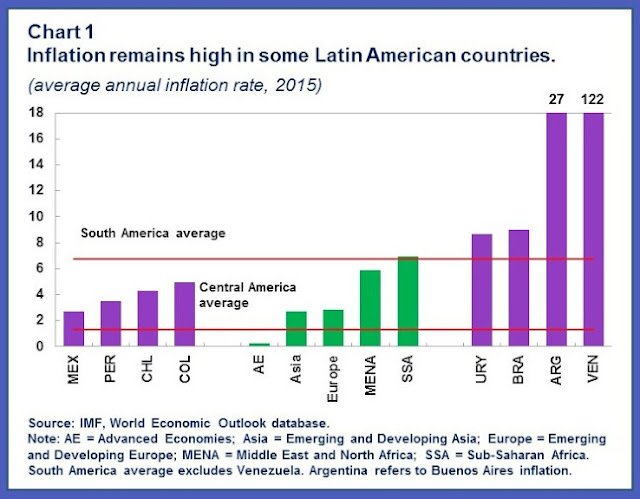 This largely explains why the inflationary impacts of the recent episodes have been so modest despite the extent of currency depreciations in countries with well-established inflation targeting regimes, such as Chile, Colombia, Mexico, and Peru. 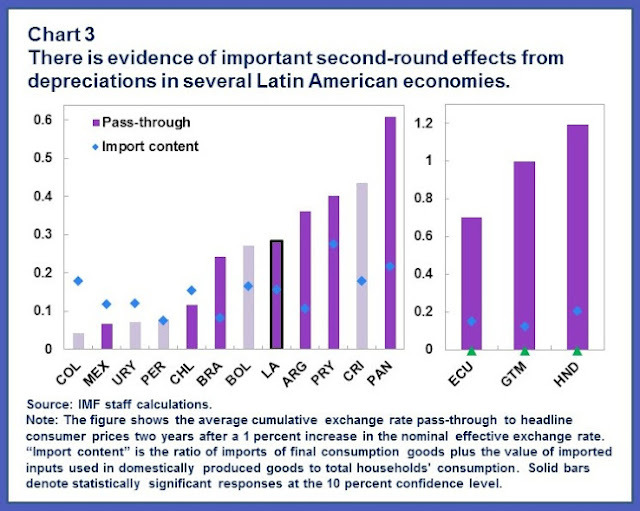 But there is substantial variation in pass-through estimates among Latin American countries, and our estimates suggest that second-round effects remain important in the region (Chart 3). While our analysis cannot fully capture the effects of very recent improvements in policy frameworks, it suggests that many countries still have ground to cover in terms of improving central bank credibility. Over time, as countries establish a strong track record of meeting their inflation targets, exchange rate pass-through will likely decline further in the region. Despite lower pass-through, the size and persistence of recent depreciations have generated enough effects to push inflation outside central bank target bands in many countries in the region. Where currencies have depreciated repeatedly in response to a sequence of external shocks, central banks have had to deal with the tension of keeping monetary policy expansionary to support weak domestic demand despite inflation remaining outside their target range for a prolonged period. This, of course, creates a difficult environment for the communication of monetary policy in an inflation targeting framework. In particular, there might be a risk that markets begin to second-guess central bank targets, causing inflation expectations to rise. Hence, monetary accommodation can only take place if markets believe in the central bank’s commitment to meeting inflation targets in the medium term. Otherwise, hard-won gains in credibility that were accumulated over a long period could be lost rapidly. That is why our advice rests on two equally important pillars. First, if central banks clearly communicate the drivers that are pushing inflation above target and the reasons behind their interest rate decisions, monetary policy can remain accommodative so long as inflation expectations are well anchored. Second, if medium-term inflation expectations begin to deviate from their target, central banks should be ready to take proactive policy measures. Indeed, most regional central banks have responded to increasing expectations by hiking rates modestly, underscoring their intention to do what is necessary to fulfill their mandates. So far, anchors have held firm, and most Latin American inflation targeters have ridden out some very large swells of external adjustment with relative success, having supported their economies with accommodative policy while rightly tolerating a temporary period of higher inflation that was outside their control. Steady reductions in exchange rate pass-through over the past two decades have helped make this possible.